A California woman says a family of bears have visited her house three times in the past two weeks - once even coming inside. 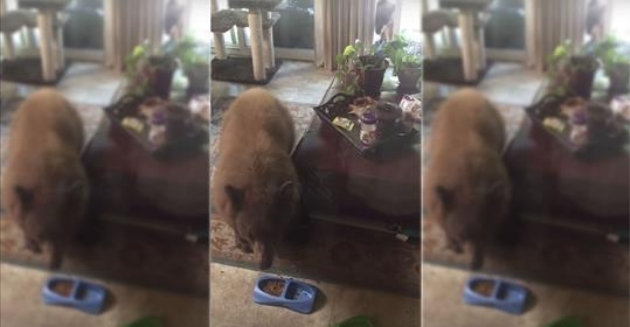 Cell phone video shows homeowner Jenny Mark’s husband trying to reason with the bear cub that had squeezed itself through a gap in her sliding door in an attempt to feast on cat food. Its mother and sibling waited just outside. Mark estimates the bear cubs weighed around 200 pounds. She said her husband tried to shoo them out, but they eventually left on their own. The Marks' neighborhood is no strangers to bear sightings. “We actually are two very big animal lovers, so we realize this is their backyard and it’s very exciting to see them. I think the whole neighborhood feels that way,” Mark said. But even for Mark, having the bear inside her home was nerve-wracking. “Being in the house a bit of a different story, but luckily they didn’t do any damage,” she said. Responses to "Bear cub squeezes into California family’s home, eats cats’ food"